Watching Amy Chu, M.B.A. ’99, stride through Midtown Comics in Manhattan’s Times Square is like watching a queen visit the heart of her realm. The staff know her, of course. She looks up a few graphic novels by writers she knows, then heads upstairs to search for some of her own back issues, breezing past posters of characters she’s written for DC and Marvel: Wonder Woman, Deadpool, Red Sonja, Poison Ivy, Green Hornet. At 51, Chu is an established comics writer, working for the biggest publishers on some of the biggest titles in the business. She’s living any comics nerd’s fondest childhood dream. It just was never her dream. As a kid, Chu hadn’t wanted to be comic-book writer—or any kind of writer. She certainly never planned on telling stories about antiheroes in spandex or metal-bikini-clad warrior babes for a living. In fact, before 2010, the closest she’d come to writing a comic book was creating a Microsoft PowerPoint presentation in her old life as a business consultant. “It’s not the same,” she says now. “No one says, ‘I was so moved by your PowerPoint presentation.’” But perhaps there were clues to Chu’s destiny in her early life. Born in Boston, she went to high school in Iowa, an experience she now describes as “fairly traumatic.” Chu was nerdy and shy and one of the only Asian kids in town, and her dream was to play soccer. Only one problem: her school didn’t have a girls’ team. When the school district forbade her from trying out for the boys’ team, Chu’s parents sued and won under Title IX. She joined the boys’ team. But the first time she stepped onto the field to play, the opposing team walked off en masse—forfeiting the game as a political statement, rather than face a female opponent. At Wellesley and MIT, Chu was more in her element than in the mostly white Iowa town she’d left behind. “I’d never seen so many Asians,” she says. “Suddenly I’m actually popular. I can actually be invited to parties.” At one party, she met the future writer and business consultant Jeff Yang ’89, then a Harvard undergraduate. Chu had founded a literary journal for Asian-American students at Wellesley, and Yang was editing a student publication at Harvard. “His whole thing was, ‘Let’s start a real magazine, an Asian-American magazine for the Asian-American population,’” Chu recalls. From Chu’s oeuvre: a 2019 comic book tied to KISS’s “End of the Road” tour and a comics imprint created by rapper DMC, with a graffiti-artist heroine. She enjoyed her time there (“It was awesome, actually,” she says. “I was pleasantly surprised.”) and became a management consultant, specializing in biotech firms. That might have taken her to retirement, if she hadn’t run into an old friend at Harvard’s first-ever Asian-American alumni summit in 2010. 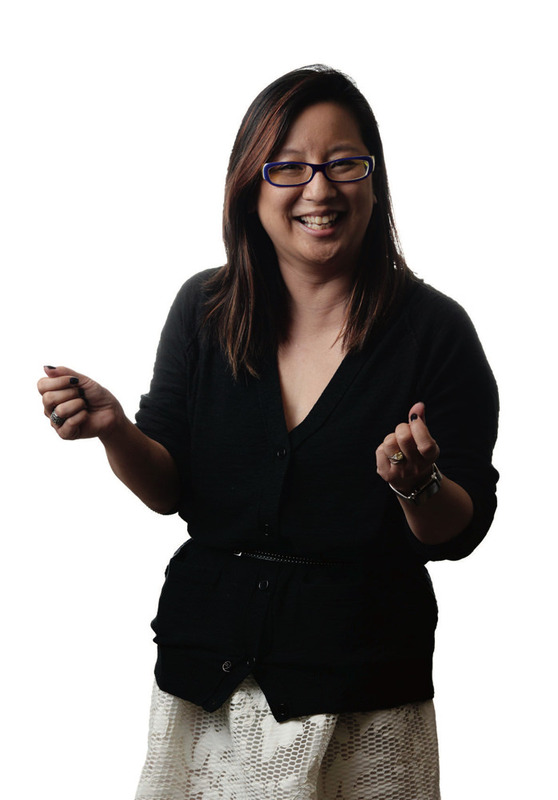 Filmmaker and television writer Georgia Lee ’98, M.B.A. ’09, wanted Chu’s help with a startup idea she had: a comics imprint for books aimed at girls. She knew Chu had helped found A. Magazine and wanted her to handle setting up the business. To Chu, it seemed like a low-cost venture. “Let’s do it,” she said. She threw herself into research, buying and reading comics for the first time and taking a class on writing comics. Lee and Chu launched Alpha Girl Comics in 2011, but Chu kept writing. The following year she self-published her own book, Girls Night Out and Other Stories, a collection of short comics, and started promoting it at conventions and comics stores around the country, which eventually led to professional writing jobs. Soon she was being entrusted with legacy characters at the two biggest comics publishers, DC and Marvel—characters like Ant-Man, Deadpool, even KISS. (Yes, the band. Yes, they have a comic book.) No matter what character she’s writing, Chu’s comics are marked by a focus on human quirks and diversity. In her Red Sonja holiday special, for example, the Hyrkanian warrior takes a whirlwind tour of the many holiday traditions represented in New York City. Her work is not all heavy metal and superheroes. Chu’s first full-length graphic novel, Sea Sirens, drawn by Janet K. Lee and being published this June by Random House, is the story of a Vietnamese-American girl who tangles with an undersea world of mermaids and sea serpents.